A 13-foot diameter cylindrical drum with a porous fabric stretched over sectioned vacuum plenums rotates in a vat filled with dilute solids. 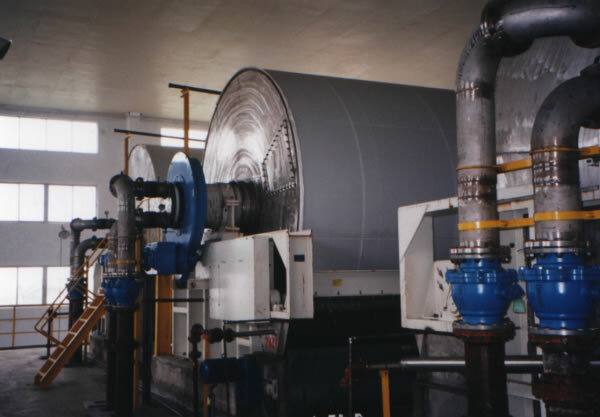 As each section of the drum rotates through the vat, solids and water are pulled to the fabric. As rotation continues the water is pulled (by vacuum) from the solids, leaving a "cake" on the fabric which is subsequently removed before re-entering the vat. Most efficient dewatering footprint (filtration surface / floor space). Versatile, adaptable to many solids formats (from sticky to crumbly). Cake washing to remove soluble contaminants. Numerous cake removal methods available. Several standard lengths: 12'(490 SF), 24' (980 SF) and 36' (1470 SF). 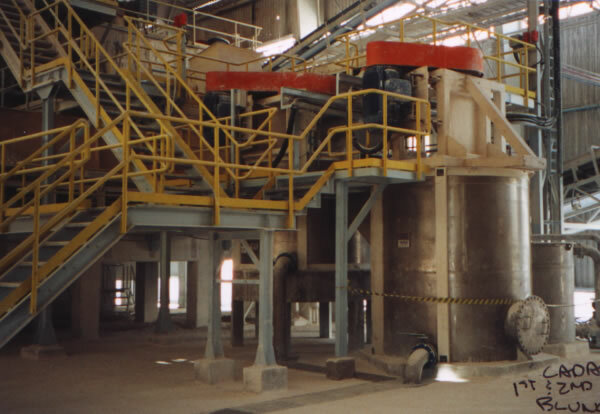 Typical Production rates: 5-25 pounds solids per square foot per hour. Reliable process rate and efficiency predicted from laboratory evaluation. Normally "attached" along side a vacuum drum filter to catch the cake falling from the filter's product discharge device. Since many minerals are flocculated for filtration, the re-pulper is the first step in re-dispersing the solids. Re-dispersion produces a fluid from the semi-plastic cake. The IMPEX trough re-pulper combines product accumulation with re-dispersion with no mess. Adaptable, adjustable flighting to maximize re-pulping. Recycle system to enhance flow in the trough. 5-15 hp gear box to chain drive can be adapted to VFD. Several standard lengths: 12', 24' and 36'. Typical conveying / production rates: 15 tph. Normally receives "feed" from trough re-pulper, the re-pulping blunger completes the dispersion using mid-speed impellers and classic internal chambering to produce a homogeneous slurry suitable for recycling to the trough re-pulper or as an in-process product. 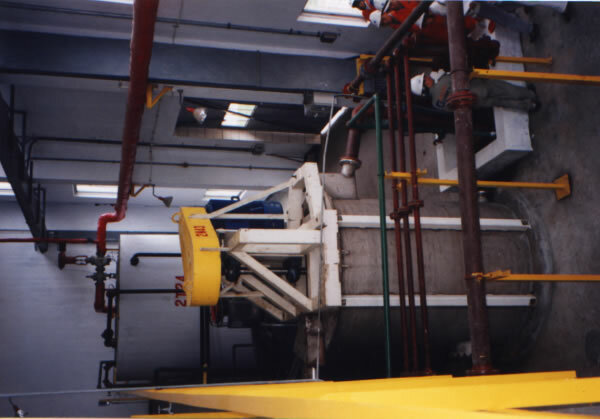 A side tank is frequently used to smooth product pumping when cake production is variable. Standard belt-drive components. Heavy-duty, long life bearings. Several sizes available to suit production of several filters in parallel. For purposes of shipping economy, increasing the solids content of a mineral slurry can be accomplished in a re-blend blunger. The re-blend blunger is a mid-speed, multi-impeller, internally chambered, mixing vessel capable of re-wetting dry material with a lower concentration slurry to produce a homogeneous, stable and fluid suspension suitable for transporting by rail, truck or vessel. Production rates of up to 10 tph (dry equivalent) at maximum fluid concentration. Internal and external heat exchangers optional. Rugged 150 hp belt drive. Top entering shaft, no bottom seal problems.